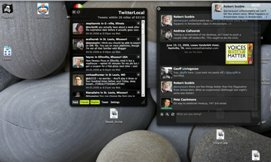 Will Twitter Now Be Competing Against Desktop Applications? It seems logical that once a web company brings on advertisers, they would want to drive as much traffic as possible to their site. Why should Twitter be any different? For Twitter, one way to bring more traffic directly to their site is to actually draw people away from the multiple Twitter desktop applications. These applications allow people to utilize Twitter without having to directly be on the Twitter.com website. 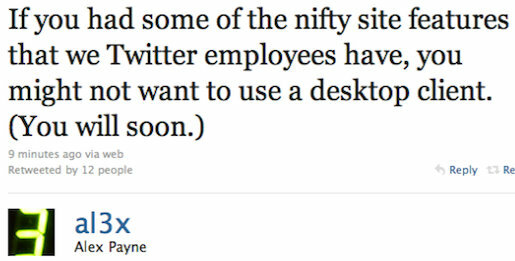 Alex Payne, a Twitter engineer (@al3x), sent out a tweet announcing that Twitter was about to release some cool new features, and that these features could make you “not want to use a desktop client”. With Twitter making plans to open up their website to advertisers, a statement like this could be setting the stage for Twitter to actually start competing against 3rd party applications and their traffic. After all, with advertisers paying for exposure on Twitter, traffic becomes a key element. And with a lot of Twitter desktop applications running, all of that Twitter traffic is actually happening off the main Twitter site. And this could quite possibly be a problem that Twitter never considered until this point. But still, even though Twitter could start competing for traffic from desktop applications, they will still offer all of their new features as an API first. Which means that developers have code access for creating cool desktop features.